By, Edward Penetin - Taken From: National Catholic Register. Pope Francis Continues To Speak On Satan And The Works Of Evil! For the third time in as many weeks, Pope Francis has warned not to speak ill of others, and again mentioned the devil in another striking homily this morning in the chapel of the Vatican’s Santa Martha residence. Calumny, he said, is worse than sin and is the direct expression of Satan. “We are all sinners; all of us. We all commit sins. But calumny is something else. It is of course a sin, too, but it is something more,” he said, according to a Vatican Radio report. He then gave the example of St. Stephen, who was a victim of calumny, wrongly accused of bearing false witness, and was martyred because of it. The Church’s first martyr, the Pope said, does not repay falsehood with falsehood. Instead, he “looks to the Lord and obeys the law”, being in the peace and truth of Christ. It’s the way of martyrdom, he said, and there have been numerous examples of those who have witnessed to the Gospel with great courage. 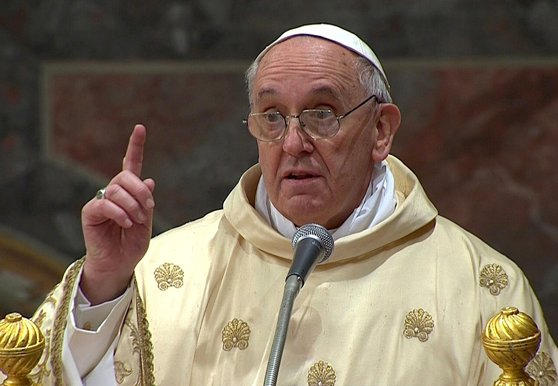 “The Church has many men and women who are maligned through calumny, who are persecuted, who are killed in hatred of Jesus, in hatred of the faith,” the Holy Father continued. “Some are killed because they teach the catechism, others are killed because they wear the cross … Today, in many countries, they are maligned, they are persecuted … they are our brothers and sisters who are suffering today, in this age of the martyrs”. Since his election last month, the Pope has also made frequent references to the devil. Observers have noted this emphasis with interest, especially as explicit mentions of the devil largely fell into disuse in the years following the Second Vatican Council. With his disappearance from Church texts, exorcists complained that the rite of exorcism had become useless against demons. Pope Francis’s frequent allusions to “Satan” and the “Evil One” may well be part of an effort —one that Benedict XVI had already begun — to cast out the presence of evil and so bring back healing and harmony to the Church, and to parts of the Vatican in particular.